Laguna Beach Oceanfront Homes For Sale in Laguna Beach can be found in many communities in Laguna Beach, California. From luxury gated communities to large Mediterranean to custom Contemporary Oceanfront homes in Laguna Beach are always in high demand. Laguna Beach has 3 main areas that run parallel with the ocean and offer spectacular ocean view homes. North Laguna ocean front homes will have the lowest inventory of ocean front homes and will also be the most expensive. Ocean front homes in North Laguna have recently sold for more than $30 million dollars in gated communities like Emerald Bay and Irvine Cove. The South Laguna area also has many nice ocean front homes that can be found in neighborhoods like Three Arch Bay and Moss Point. Other notable area include Circle Drive and along Coast Highway with homes that sit right above the sand like the famous "Rock House" that is now on the market for sale. The South Laguna Beach area is your best bet to find the best deals and the largest inventory of oceanfront homes. Budget around $4 million dollars and up for a home on the water in this location. Laguna Beach is all about location so prices will fluctuate depending on where the property is located. 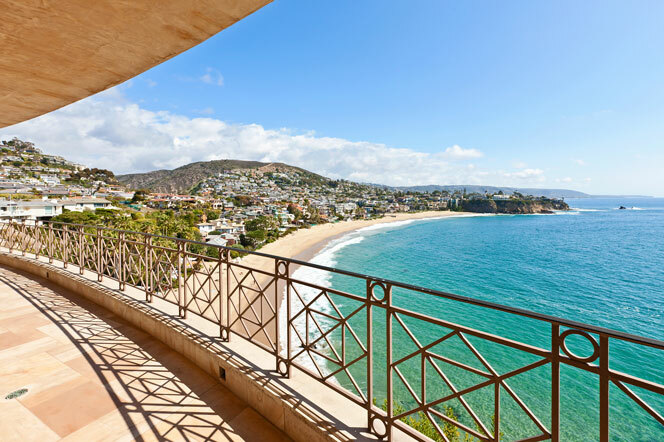 Below are all the ocean front homes and condos currently on the market in Laguna Beach. For more information about Laguna Beach Oceanfront homes for sale please contact us today at 949-355-1622. We specialize in Oceanfront homes and Laguna Beach Real Estate.